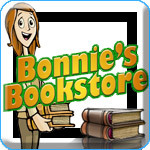 Bonnie's Bookstore Game Review - Download and Play Free Version! 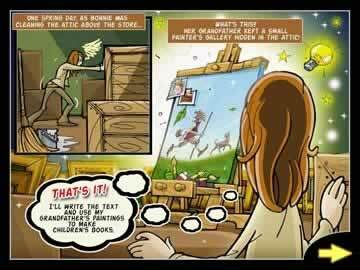 Help Bonnie Acheive Her Dream of Being a Children's Book Author by Helping Her Overcome Writer's Block! Fun storyline that has you helping Bonnie overcome her writer's block. Two game modes, action and classic, allow you to play the game at different paces. Great way to improve your vocabulary. Level to level the game doesn't change. No multiplayer or online play. Bonnie is looking to make it big writing children's books. She needs your help though, there are so many words to choose from, she is in real danger of getting writer's block. In order to help Bonnie, you will rearrange tiles and help her to form words using the available letters. Watch out though, writer's block can even hit you! Get more points for forming harder words and help Bonnie write a store that can get her published. It is a difficult thing to be a writer, that's why she needs all the help she can get. Enjoy learning new words and increasing your own skills as you help Bonnie. Sit down and get ready to be quickly addicted by this fast paced word game! Bonnie's Bookstore is a fun word game that has a little to do with a bookstore and a lot to do with spelling. In this game you help your friend Bonnie who has succumb to writer's block. She is wanting to write a children's book, but chapter to chapter she is faced with new challenges and has to overcome the daunting “Writer's Block.” Through spelling and deciphering words from a game space full of letters, you help Bonnie with her book, while collecting points and advancing to the next level. Bonnie's Bookstore is similar to other games in its genre in that you form words by connecting adjacent letters. For example if the letters C, A, and T are all connected, you could click on them to form the word CAT, completing a word to earn points. However, this game differs slightly from most other games in a couple of ways including the rules of play as well as the different modes of play. Yes, the basics of the game are relatively simple and ordinary, but the goals per level are different than in most word games. As you form words the letter tiles used to make the word turn green. It is your goal to make all of the playing space green in either the allotted time or within the allotted number of turns. The length of your words determines their value (shorter words are worth less while longer are worth more) and the rewards you earn. Word of five letters or more earn you “Wild Stars” that can be used in place of any letter within a word. These leave once the word is spelled. Shorter words that are three letters in length often bring about writer's block, which are stop sign shaped pieces that are obstacles in your way to write bigger words. Other perks available are “Bonus” letters (earn more points playing these tiles) and “Wild Card Stars” (wild card pieces that never leave the game). These perks add a great upside to the game, while the Writer's Block adds a difficult strategic element. The two different game modes are very similar in play and can be played interchangeably in your quest to help Bonnie. Meaning, if you start playing the Classic mode, quit on level five, and then begin playing the Action mode, you start back on level five where you left the game earlier. This interchangeability is a nice addition to the game because regardless of your desired style of play, you are still taking advantage of the game's adventure—helping Bonnie with her writer's block. The Classic style of play only differs from Action mode in one aspect. In Classic you have a certain number of turns to solve the puzzle and turn the whole board green. The first level (chapters as they are referred to in the game) gives you about 40 turns to change the board green, while later levels increase in difficulty, thus reducing the number significantly. Action mode does not have a turn baseed style of play. Instead you are racing a clock in this mode. You can use as many turns as you like, as long as you complete the puzzle before the time runs out. Not having a multiplayer mode or online play really limits this game. If you could challenge your friends or take your spelling abilities online—competing against players from around the world—this game would be much improved and more enjoyable. The quest to help Bonnie write children's books is fun, but it lacks multiplayer capabilities. A mode that would have your successes not only help Bonnie, but also cause your competitor to have more writer's block would improve the game and make it connect with more people. Having only one difficulty setting also limits this game for certain players. The game would be much better and more accessible to a younger audience if the difficulty settings were adjustable. At times, especially as you advance, the levels can become too challenging for less experienced writers. Overall, Bonnie's Bookstore is worth trying. Play the trial and see what you think. Realize this is less about books and a bookstore than it is about connecting letters to form words. 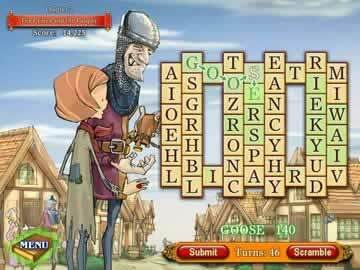 The game is educational and is something fans of word games are sure to love. If you are just starting to play word games or are looking for a game with multiplayer or online capabilities this might not be right for you. However, if an adventure style word game with two game modes is what you are looking for, don't hesitate to download.